Everyone should own a good pair of headphones. They’re the most essential, yet also the most affordable and easiest to use consumer audio devices out there. Yet, the most common reason for not owning one of these highly useful gadgets is ‘I wouldn’t be able to afford one’, or, even more common, ‘I wouldn’t be able to afford a good one’. Well, consider yourself proven wrong in case you ever thought that way since we’re here to show you the best headphones under 50 dollar and less. So sit back, relax and grab your purse! You may see a change in the current price of the product. At the time of publishing article, the price of every product was under $50. Here are some cheap but quality headphones under 50 dollar. 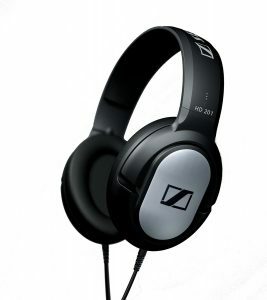 If you know anything about Sennheiser, you may be scratching your head at the sight of this one on our list. Aren’t they that one audiophile-grade luxury brand that prices their top-of-the-line headsets for four figures? I hear you ask. Well, yes, that’s the one, but they also produce a few budget models like this one. Okay, so perhaps the MSRP of $60 is not quite within the boundaries of ‘$50 or less’, but since we’re talking about a model that’s already a few years old, it’s easy to find a pair of HD 201s for $35 or even less on various online marketplaces and audio shops. Anyways, how do they sound? Exquisite would be one way to describe it. Simply put, what you’re getting with the HD 201s is a no-nonsense, bare-bones package of Sennheiser’s finest audio tech, the likes of which is usually put in headphones worth much, much more, priced this low simply due to its simplicity and lack of luxury appeal. Take our word for it: These headphones blow almost any other in their price range out of the water in terms of audio performance. However, that’s also the biggest problem with the 201s: Due to the heavy focus on performance, a lot of comfort and convenience “usually hallmarks of Sennheiser products” has been lost. So, what you end up with is a high-tech audio system encased in a boring-looking, plastic-heavy, cheaply made body that doesn’t feel superbly comfortable to wear. So, if you’re one of those rare budget audiophiles “something that should honestly be considered an oxymoron by now” then the Sennheiser HD 201s may be just your kind of thing, pumping out the best sound you can get for less than $50. 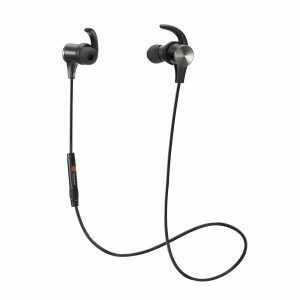 The confusingly-named SENSO Bluetooth Headphones, “which are in actuality earbuds, not headphones” are designed mainly with sports enthusiasts in mind, offering a variety of gym-friendly features, the most prominent of which is probably the large wings protruding from each earpiece. These are simply designed to hold the earbuds in place while you’re wearing them and prevent them from slipping off at any angle. As the name obviously implies, the SENSOs also features Bluetooth for practical, wireless connectivity, but there’s still an audio cable running between the two earpieces. For some added convenience, there are also two extra pairs of silicone ear tips provided, sized differently to accommodate almost any ear shape and dimensions. To top it all off, there’s an integrated battery with one full charge lasting 8 hours and the construction is designed to be fully waterproof. You even get a little SENSO-branded bag to store your earbuds in. And all of that comes in at a measly $30! However, there are two problems that quickly become evident when using the SENSOs for any lengthy amount of time. The first is the audio quality. It’s sufficient, and mainly geared towards volume in exchange for some lack in quality, but it will most likely be enough for the intended target audience. Just enough. The second is the build quality. Waterproof or not, the SENSOs rely very heavily on plastic, and not the kind of thick, ugly plastic used on the Sennheiser HD201s, but the entire opposite: Good-looking, but incredibly thin and flimsy plastic that is easily bent and broken. If you are a sports freak, the SENSO Wireless earbuds might seem like a match made in heaven and a great deal at the same time, and rightfully so. No wonder, with a large set of features catering mainly to highly active gym users and workout-aholics. Just make sure you know how the price of $30 is a compromise in some areas before buying. You might not recognize the name Mpow, but they’re a well-established manufacturer of inexpensive audio hardware. One of their most popular models is this one, simply called the Bluetooth Headphones. 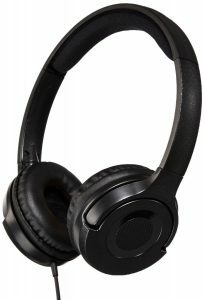 So, like the SENSOs, these feature wireless connectivity, but unlike them, they are over-ear, full-sized proper headphones, much like the Sennheiser HD 201s above. Still, the price tag of just $37 remains pretty low. So, how are they? One word: Comfortable. That’s the main advantage the Mpows have over other products in their price segment, comfort. We don’t want to belittle the sound quality this way, which is also above-average, no doubt, but thanks to protein earmuffs, an adjustable headband, and other comfort-enhancing features, the Mpows just happen to excel at this particular discipline more than any other. For some added convenience, the whole pair can be folded and stored in the bundled carrying bag. Sounds like one well-balanced pair of headphones, doesn’t it? We concur, and the Mpows are solid performers in many areas, but there are yet a few things to nitpick about them. Like the integrated microphone. Yes, there is one. Why didn’t we mention it before? Because it is barely usable. The call quality is borderline horrible, and there are some issues with drivers on newer versions of Windows. Then there’s the Bluetooth implementation, which works fine in terms of connectivity, but at the expense of degrading sound quality, so, despite being advertised as Bluetooth Headphones, the Mpows only really shine when used in wired mode. 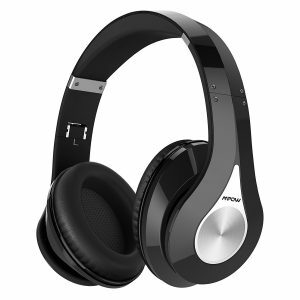 So, for a pair of headphones worth $35, the Mpow Bluetooth Headphones are quite the nice deal. Just forget about the name, only use them in wired mode and, oh, ignore that stupid mic. Once you get past the name, these Panasonic earbuds are the embodiment of a very simple premise. Designed as the ultimate budget offering, they are tiny in terms of size, packing only the minimal amount of components necessary for outputting sound, nothing more. Then again, with a sticker price of $8.50, who could refuse? Okay, so we can’t really talk too much about the Panasonic’ strengths, since, well, there aren’t that many besides the form factor and price. On the other hand, there are plenty things to criticize, like the dull sound, cheap plastics, lack of comfort and boring looks. But does that really matter when it’s just a question of $8.50? Forget about headphones under $50, for this is the ultimate budget product. If you just want to know what the lowest possible price point is at which it is still possible to buy a quality product, in this case, headphones, then, well, the Panasonic RP-HJE120-Ks sit right at the edge of that price point. Whether that’s a good thing or not is up to you, of course. 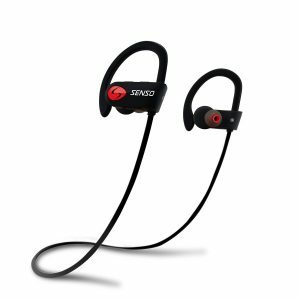 These earbuds seem awfully similar to the SENSO earbuds above at first glance, and just like them, they are mainly geared towards sports enthusiasts. And for only $25, much less than the SENSOs, you can’t go wrong, right? Considering features, the TaoTronics are loaded full of them. You get wings to hold the earbuds in a place like on the SENSOs, but also Bluetooth 4.1, a magnetic tip to clip the two earpieces together for easy storage, an integrated mic with in-line controls and noise isolation via the ear tips. All in all, a nice package, and the sound quality don’t disappoint, either. So, what’s the catch? Simply put, the Bluetooth connectivity, probably the TaoTronics’ most convenient feature, is a little of a hassle to work with. It’s notorious for not pairing properly with a whole slew of different devices “Just check the reviews for it on Amazon” and overall, a lot less refined than the Bluetooth in some other headphones we’ve tested. In addition to that, we found the volume on the TaoTronics to be a little dim compared to the competition. If you like to blast music out on full volume, these are not for you. Other than that, though, you’re getting a very nice pair of earbuds considering their price. The market for low-priced sports-optimized in-ear headphones just became more complicated thanks to the TaoTronics Bluetooth Earbuds. Like any other device, they’ve got their strengths and weaknesses, and like any other on our list, the former outweigh the latter, but it’s up to you to decide ultimately if unusually low volume and finicky Bluetooth is worth a well-performing, well-equipped pair of earbuds for $25 or not. The confusingly-titled MDRZX110NCs by Sony is a very typical pair of on-ear headphones, compact budget-friendly hybrids that try to bridge the gap between usually higher-end over-ear and size-optimized in-ear headphones. Are they well-priced? Yes, unless you consider $40 to be too expensive. Do they sound nice? Sure, very much so, in fact. Do they look nice? But of course! Do they feel nice to wear? Let’s just say they’ve got some of the thickest cushioning we’ve ever seen on a pair of headphones in their price range. And what extras do they come with? Unfortunately not much. The frame is foldable and adjustable, so there’s that for practicality’s sake, but apart from that and the Bluetooth function, which includes a heavy-duty battery with staggering 80 hours of playtime, there isn’t anything to look at. Nothing. If you’re looking for more than just good sound, these are not your kind of headphones. So, while the Sony MDRZX110NCs might not be as chiefly focused on pure sound as the Sennheiser HD 201s “and they really can’t be compared in that regard” they do both plays in the same league. 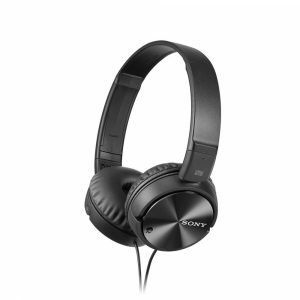 Both are rather basic, but inexpensive headphones for the aspiring audiophile, the Sony model just adds a few slight creature comforts to the formula. 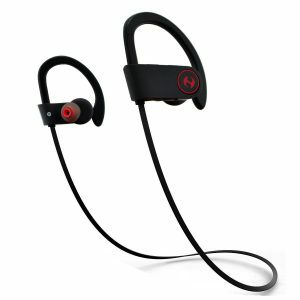 The Hussar Magicbuds could easily be mistaken for the SENSO Bluetooth Headphones, and for good reason. The two look almost exactly alike at first glance; most likely, there’s one OEM supplying both Hussar and SENSO with the respective components. However, some details are notably different between the two. For example, the battery used for the Hussars has been slightly improved in comparison with its SENSO counterpart, now offering up to 9 hours of playtime instead of just 8. Also, new controls for playback and volume have been added to the earpieces for quick adjustments. There’s a new Active Noise Cancelling feature, too. And on top of that, the price has been lowered to $27! The problem with all of these new features is that they’re inherently flawed in ways that expose them as Hussar-made additions to a formula laid down by SENSO. For example, we didn’t observe any difference between the playtime of the SENSO earbuds and the Hussar Magicbuds in spite of the different ratings. The new controls are a nice idea, but we found the buttons too small and flimsy to work with, so adjusting settings via our phone was much easier, just like on the SENSOs. And finally, although Active Noise Cancelling is a nice idea, the system employed here significantly degrades sound quality and volume once activated, almost ridding it of its purpose. As yet another alternative to the SENSO earbuds, the Hussar Magicbuds don’t really disappoint, offering most of the former’s strengths, but do consider your buying decision. You may be paying $3 less, but you are paying for some new features you may not need or find useful. On top of that, walking around with what could be described as counterfeit merchandise may not be that attractive for some buyers. Ah yes, AmazonBasics. The go-to brand for cheap-as-hell electronics. Of course, they also sell a pair of on-ear headphones. 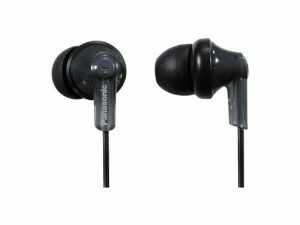 Rivaling the price of a certain kind of Panasonic earbuds, they come in at an outrageous $15, and just like the aforementioned Panasonic, they disappoint in almost every way besides the low price. Expect poor sound, so-so comfort levels, a cheap, and we do mean cheap construction and, to top it all off, a non-adjustable frame that may or may not fit you properly. But at least they only cost $15, right? You may wonder why this product is on our list. After all, it has more cons than pros, shouldn’t it be disqualified from a ‘Best-of’? Our answer is that we think the AmazonBasics serve as an example, a statement that must be said. That statement is, ‘Don’t overdo it!’ Budget-hunting is fine, but eventually, if you go too far, you may end up in AmazonBasics territory. Don’t get us wrong, the AmazonBasics On-Ear Headphones are okay, otherwise ,we really wouldn’t be including them in our lineup, but there are so many better alternatives out there for just $10 or $20 more! Imagine the possibilities! If you’re on the strictest possible budget, though, well, you’re not gonna get anything better than this. Yet another competitor of SENSO’s, the Anlo Bluetooth Headphones, which, yet again, are actually earbuds in spite of the name, feature an attractive, angular design that promises high-end materials in and out. Like many other SENSO-derivatives, the Anlos try to be attractive to prospective buyers via a lowered price of $22. 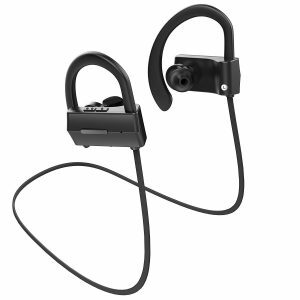 You also get controls on the earpieces similar to the Hussar Magicbuds and Bluetooth 4.1 with an estimated battery life of 7 hours as well as active noise cancelling and an integrated mic. The latter two features are unfortunately fundamentally flawed in a number of ways. Whilst the noise-cancelling in this headphone is unexpectedly poor at doing just that, cancelling noise, the microphone is so low-quality we actually forgot about its existence halfway through testing. If you want to use these earbuds as a makeshift headset, well, don’t. Buy a something else. Well, what do we have here? Another pair of earbuds just like SENSO’s? Oh well, at least these have a mic. That you can’t use properly because it’s that bad And Noise Cancelling, they’ve got that, too! But it doesn’t really work that well, either’! Truth be told, the Anlos are SENSOs, and the main reason to buy them is if you found the SENSOs nice but want to save a few bucks. In that case, be our guest, grab yourself some Anlos. Okay, we promise we’ll stop. Just this one. That’s it. So, the Otium Bluetooth Headphones are yet another derivative of the SENSO model of the same name! They largely feature the same technical specs save for some slight changes, such as a different exterior design, lower price of $20 and a different set of buttons for quick setting changes. Though their functions have been reduced to just one button for ‘Next’ and one for ‘Previous’, even though other SENSO-derived headphones in some cases possessed ones for volume settings and more. So, what more can we say? Same basic advantages as the SENSOs, but also all the flaws. The plastic is still cheap, the mic is still useless and the Noise Cancelling is, too. The list goes on. This is the ultimate reduction of the SENSO design. If you wanted to know how many bucks you could shave off of something that already costs $30 in its default form, then this is the answer. It doesn’t get budget-ier than this. 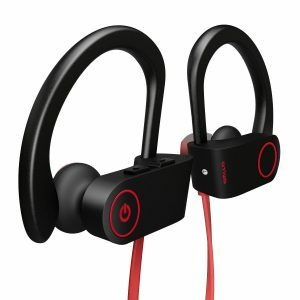 Of course, only some will appreciate such a cost-saving product, but those that will will probably only have good things to say about the Otium Bluetooth Headphones. We just tend to see things a little more two-sided, you see. Yes, the Sennys take the cake for us. Whilst they may not be the most well-made or the most comfortable, in terms of sheer sound, they have no equal in the sub-$50 region. And you get todisplay the famous ‘S’ logo proudly while you’re wearing them, making your friends scratch their heads in disbelief at how you got to wear such a high-quality, high-prestige product. That is until they step closer and discover the cheap plastic it’s made of. But hey, on a pair of headphones, the sound should matter more than anything else, right? In conclusion, you may not share our opinion completely when it comes to the best headphones under $50, but that’s not actually that important, you see. What’s important is that you now recognize that, yes, headphones are not a luxury item. They’re not reserved for the upper class. You can own a pair, too, a really good one, even, you just have to look around.